>As a regular traveller to Morocco I am still amazed by the enormous diversity that Marrakech offers when one considers that it is less than three and a half hours away, from the UK, by plane. The main square of Djemma el Fna surrounded by its endless labyrinth of souks (bazaars) is well documented and conjures up visions of snake charmers, acrobats, sooth-sayers, musicians, food stalls and the like. Fascinating, it certainly is and especially when the sun is starting to set and the rich abundance of gastronomic flavours fill the air, trapped in plumes of smoke and steam to give the Djemma-el-Fna a twilight eeriness, a mesmerising quality I have found nowhere else. As the evening darkens, the hustle bustle of activity rages on. The exotic music appears louder and more hypnotic. Directly south of the Djemma-el-Fna is Rue Bab Agnaou. A five-minute walk takes you straight to the famous Bab Agnaou entrance to the Kasbah district of the Medina. The Bab Agnaou entrance, through the ramparts, is by far the most impressive entrance of all medina rampart entrances. This comes as no surprise when placed in context with the Kasbah. The Kasbah was the first Citadel of the Sultans of Morocco, as such, Bab Agnaou is the posthumous entrance for Sultans, state visitors and their courtiers alike. Inside the Kasbah one finds a contrast between that of the Djemma-el-Fna only a short walk away. The street stallholders are more accommodating and less insistent; there is an air of order, discernment and a lack of intimidation. The Kasbah is home to the Royal Palace, also the former El-Badi Palace and the Saadian Tombs (an exquisite burial site of past Sultans that was only rediscovered at the turn of the last century). This naturally creates better security, cleaner streets and a hint of being a special place within the medina. In recent years my family has visited Marrakech during most half terms, buying gifts for Xmas stocking fillers, winter sun, Easter exotic on a budget and have almost exclusively looked for Riad accommodation in the Kasbah. A Riad is a Moroccan house with an internal courtyard. Most windows are inward facing towards the central atrium. This design of property suites Islamic tradition as there is no obvious wealth statement being made externally, no windows to peer through. Entering a Riad is like discovering an Aladdin’s Cave in comparison to it’s non-descript exterior. The Kasbah has a good selection available to meet most budgets; the Kasbah also boasts three superb Riad converted hotels, La Sultana located next to the Saadian Tombs, which is very close to Bab Agnaou. 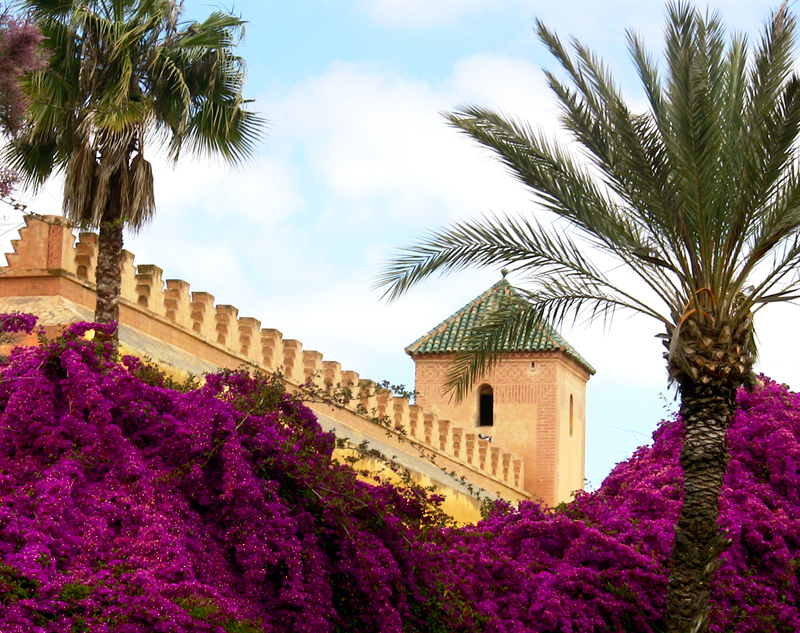 Les Jardin de la Medina and Les Borjs de la Kasbah are within a minute of each other at the southern, quiet, end of the Kasbah very close to the entrance to the Royal Palace and the Sultans Agdal Gardens. A pleasant route to access the southern end of the Kasbah is to follow the outside rampart walls past Bab Agnaou and Bab er-Rob gates until you get to Bab Ksiba, which is easily recognised by the huge eucalyptus tree on it’s left hand side. This route has a second advantage in the winter months as it gives you an un-hindered view of the Mighty Atlas Mountains, which lay due south of the Kasbah. From Bab Ksiba (the taxi drivers pronounce Bab Lak-siba if you simply want to visit) walk straight, then left at the end, then right and within 100 meters you will find yourself at the far end of Rue de la Kasbah which runs parallel to the outside walls and will take you back to Bab Agnaou and past the Saadian Tombs. The Kasbah has it’s own little bazaars (Souikas), food stalls, restaurants, hotels and riads for travellers to enjoy. For my family…. We do enjoy the Djemma el Fna and it’s cacophony of exotic wonders but would not want to be immersed in it 24/7 during our stay. The Kasbah is “not too far…. from the madding crowd” but a short peripheral distance away to enjoy then retreat to some semblance of tranquillity. As the Editor of http://www.marrakech.uk.com I regularly travel to Marrakech to review riad, hotel accommodation, attractions, services and restaurants. I specialise in the Kasbah quarter within the Medina district of Marrakech.